The ADVENTurous KAL was a December phenomenon for knitters. With just over 30 days to knit the ADVENTurous Wrap, about 400-some knitters participated to create their own stash-busting project. For the low-down on the KAL particulars, read the first four posts in this thread on Ravelry. There is an amazingly detailed official Google spreadsheet to detail the color use per row. It was very cleverly constructed and executed for variety and enjoyment. The community element, as always, was a huge draw for the ADVENTurous KAL. There was a swap option with mini skein swaps and stash sharing in this Ravelry group, plus Miss Babs had sets! What struck me most about this is that there are so many KALs these days, many of which that go viral, but witnessing how a small group of friends customised the KAL to be a smaller group activity while still being completely involved in the larger ADVENTurous KAL discussion on Ravelry. This post focuses on how six of my friends (referred to in this post as ‘the Holiday Yarn ladies’ or ‘HY ladies’ or by their names) had a fun approach to the KAL by splitting full sock-weight skeins to create minis in 11 colors to redistribute in their group within the KAL. They let me follow along on their ADVENTures and document the set-up, process, and results for this post. Ambah O’Brien’s ADVENTurous Wrap is new on the scene, having been published in November 2017 in time for this KAL to launch it into the world. It already has 471 projects and is in 379 Ravelry queues. With a low average difficulty rating and high pattern rating, Ambah may have a seasonal favorite on her hands. Part of the fun of a KAL, especially with mini skeins, is the element of surprise. Though there is a FO thread on Ravelry for anyone who loves cheering on fellow knitters at the finish line. There was also a full spoiler alert thread. In her pattern, she offers two approaches: Option A (fade) or Option B (stripes). I personally prefer the fade because it is the colors of the beach, but I sat this KAL out to work on a secret design project (reveal coming in early 2018). I’ve queued the pattern to knit next Advent season. Much like Leftie, the design of ADVENTurous invites leftovers to be featured and appreciated. The timing was perfect given the season and so often as knitters we have spare scraps remaining at year’s end from our annual knitting adventures. And, let’s face it, mini skeins and projects to use them are all the rage right now. Here is a photo from Margot of all the mini skeins. In addition to sending in the full skein for winding into mini skeins, the ladies could also send little goodies to redistribute for holiday merriment. The entire objective was delightful and sweet, bringing the ADVENTurous KAL to a more intimate level of friendship. Margot prepared five boxes with 25 mini skeins. She did it all in four or five days! The 25 bundles created a lovely project-focused Advent calendar for each of the HY ladies. An entire ADVENTurous kit. No HY lady received the same order of mini skeins and each parcel was labelled with the day. Here is a photo of the five sets, then more about how it was arranged. Then each mini skein was wrapped and numbered with precision and in order to prepare into a complete parcel for each of the five HY ladies. This is the beautiful package they each received. Isn’t it lovely? 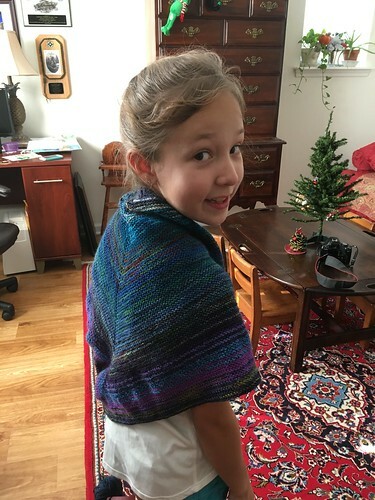 Marseille had her niece model the first half at Christmas and it is actually a rather perfect child’s shawlette size. No knitting post is complete without a woolly photo, right? The HY ladies shared their own photos of their finished objects so you could see them here. This gives you a good idea what the shawl looks like with a nice selection of mini skeins in various color orders. Margot used size 4 US (3.5mm) knitting needles and her resulting shawl covered her queen-sized bed diagonally as it was being blocked. The left side reminds her of the Rainbow Mountains of Peru. Don’t you think? With the mini skeins not being completely used for the shawl, there are leftovers. Here is a photo of Margot’s leftovers. For yarn scraps, I have a whole post listing patterns that work well with mini skeins and leftover yarn: Fabulous Knitting Patterns for Yarn Scraps and Mini Skeins. I also wrote a post about How to Create Your Own Yarn Advent Calendar with Leftover Sock Scraps. Did you participate in the ADVENTurous KAL? How did you approach the mini skeins? What did you think of the experience and final shawl? Post a link to your FO on Ravelry so I can admire it! This entry was posted in Knit Shawls & Wraps and tagged Marseille.